Visawjyothi had a good start in the as they led 22-10 by the end of the first quarter .But, the second quarter saw Muthoot coming back in to the game through Alan Paul and Anto Prince as their consistent scoring cut the away team’s deficit to just one point by the end of first half and the score line read 31-30 at the interval. The second half saw an evenly contested match and witnessed some quality three pointes from Sravan Sunil and Nikunj and some timely baskets from Jayakrishnan. The home support also helped Viswajyothi to held their nerves to finish the match on the winning side as the final score line read : 66-63 . 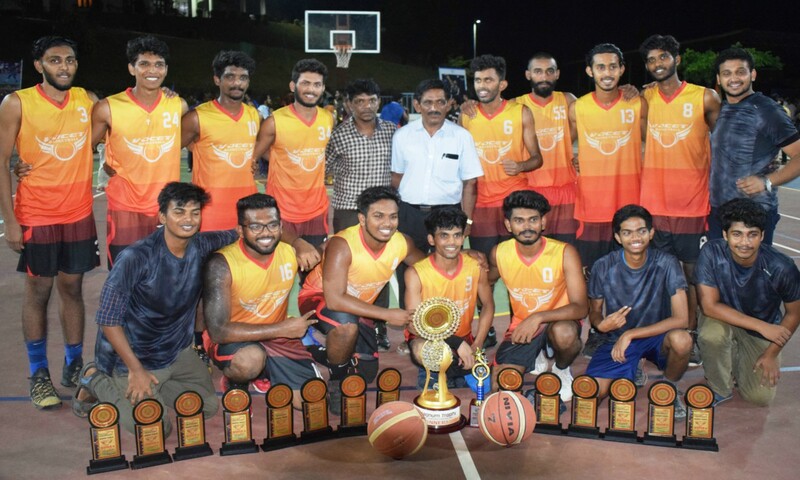 Nikunj was the leading scorer for Viswajyothi with 16 points while Jaykrishnan scored 14 points. Sravan Sunil who was adjusted as the best player of the Tournament contributed 13 points for the host team. Muthoot who missed some free throws at crucial junctures of the match but provided an nail biting finish thanks to former Youth State Player Anto prince who scored 28 points and Alan P Paul who scored 18 points. Cash prise and Mementoes were distributed by the director of the college Dr George Thanathuparambil.